NYC, 05/11/2019, 2:00PM. 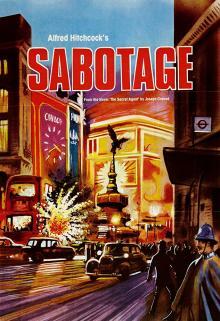 Alfred Hitchcock's Sabotage (1936): Spies In London. Starring Sylvia Sidney, Oskar Homolka, Desmond Tester. The story is is loosely based on Joseph Conrad's novel The Secret Agent. In 2017 a poll of 150 actors, directors, writers, producers and critics for Time Out magazine saw Sabotage ranked the 44th best British film ever.